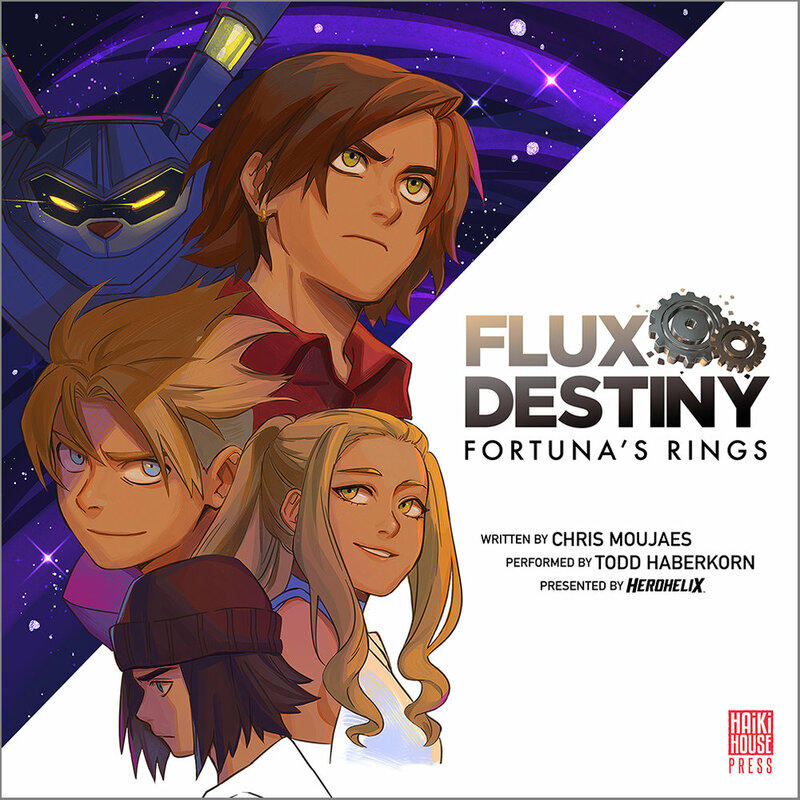 Hi there, I'm Chris Moujaes (here’s a hint: Mo-JEYE-es), the creator of Flux Destiny and a few other original fictional universes. I'm a film executive, producer, character designer, and writer as well as a full-time dad to two little girls, a cat named Sheldon and my best buddy, Bentley, an Australian Shepherd. I'm the founder of Herohelix, a studio that produces original fictional universes through books, graphic novels, and animation. It's at Herohelix where I spend my time developing stories like Flux Destiny. I graduated in 2001 from the University of Texas at Austin with a B.S. in Radio-Television-Film. Since then, I've spent most of my early career as an entertainment and animation executive who specializes in developing, financing, producing, and distributing animated motion pictures, live action films and music for the international marketplace. From 2009 to 2015 I was the Head of Original Entertainment at Funimation Entertainment, a worldwide leader in Japanese anime distribution and a unit of Sony Pictures Television. Over my 6 years with the studio, I managed millions of dollars in motion picture production and supervised the production of all Funimatin’s original movies as Executive Producer. The highlight of my time there was serving as executive producer of the Dragon Age and Mass Effect anime movies based on the hit video games by BioWare. Here’s a big shout out to all my fans who continue to support my studio's work! It's fans like you who allow small independent studios to produce thoughtful originals in a market saturated with sequels and big franchises. Shigeru Miyamoto, prolific video game designer behind Legend of Zelda and other legendary Nintendo universes. The works of CAPCOM, especially the Megaman franchise. Video game franchises like The Final Fantasy series, Kingdom Hearts, and Splatoon. Q: What equipment do you use to create stories and art? All my contemporary, digital art is done using a Wacom Cintiq 13 HD tablet on Adobe Photoshop CC for iMac. Occasionally I’ll use Adobe Illustrator for certain design work. For my traditional art pieces, I use COPIC-brand markers. Q: What are your must-have supplies/equipment? Believe it or not, give me a notebook and a black or blue 7mm pen, and I’m content. A lot of my brainstorming happens in my notebooks which I honestly believe are a storyteller’s greatest tool. When you’re in your notebook, there are no rules and no one to judge you. So, my greatest epiphanies have come from free writing and drawing in my black Moleskine notebooks. Q: Do you have tips for aspiring artists and writers? Draw. Write. As much as you can, as often as you can. If you’ve heard this advice before, it’s because it’s proven. You can’t improve without drawing. You can’t build universes without writing. So get to writing and scribbling. Q: I’ve got a bad case of creative block. What should I do? See the question above. If I can’t write, I draw. If I can’t draw, I write. If both fail, I watch shows, play video games, or listen to music that inspires me. I’ve found that the only way to break through creative block is to literally break through it. That is, you have to write or draw your way out of it. Even if what you’re writing or drawing doesn’t make sense. It’s like when a car gets stuck in the mud. The only way to get it out is to rock and back forth and push it out. If you do nothing, it’ll just stay. Stuck. Q: How do you come up with ideas that are so well-formed? This is a question that I used to ponder when studying the works of other creators. One of the most liberating discoveries I’ve made in my career is that in 99.9% of cases, ideas don’t come out fully formed. A new idea is usually a hot mess, and it takes lots of iterating to get it to take shape. I’ve been working on Flux Destiny for years and its contemporary form bears little resemblance to the original concept. Which leads me back to my advice for aspiring artists and writers above: Write. Draw. Constantly. That’s how ideas take shape. Invite Me to Your Next Convention! Click Here To Invite Me! Click on the button above to take you to my official profile page! You can share this with your local anime, gaming or entertainment convention to suggest me as a guest.